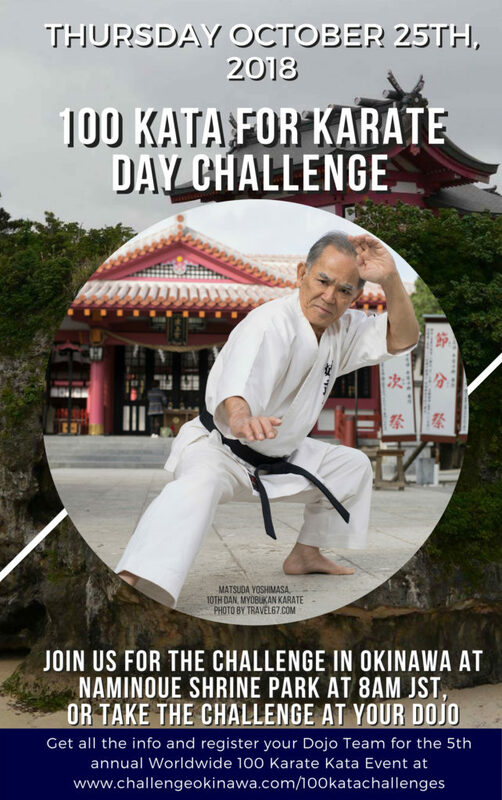 2018 100 Kata for Karate Day Challenge poster – Challenge Okinawa! Greetings from Okinawa to all 100 Kata Challenge participants. First, apologies as we are a little behind schedule due to local typhoons, but here is the event poster for our upcoming challenge event on October 25th 2018. This year the poster features Okinawa Shorinryu master Matsuda Yoshimasa Hanshi (10th Dan). Matsuda Hanshi will be kicking off the 100 Kata Challenge here in Okinawa at Naminoue Shrine Park, located in Tsujimachi near his home and dojo. Please feel free to use this to advertise your local 100 Kata Challenge event too. Share online or print offline to use in your dojo and other locations.